Blah. Winter. Hashtag Blah | Food It Yourself! Not sure if you’ve heard, but it’s been snowing in Central Massachusetts. It’s been snowing since the last week of January. As of February 12, 2015 a whopping 92.1 inches (that’s seven and a half feet) have fallen on Worcester County. It is snowing more as I type this. If you believe famous wood chucks and Sam Champion there is more to come. 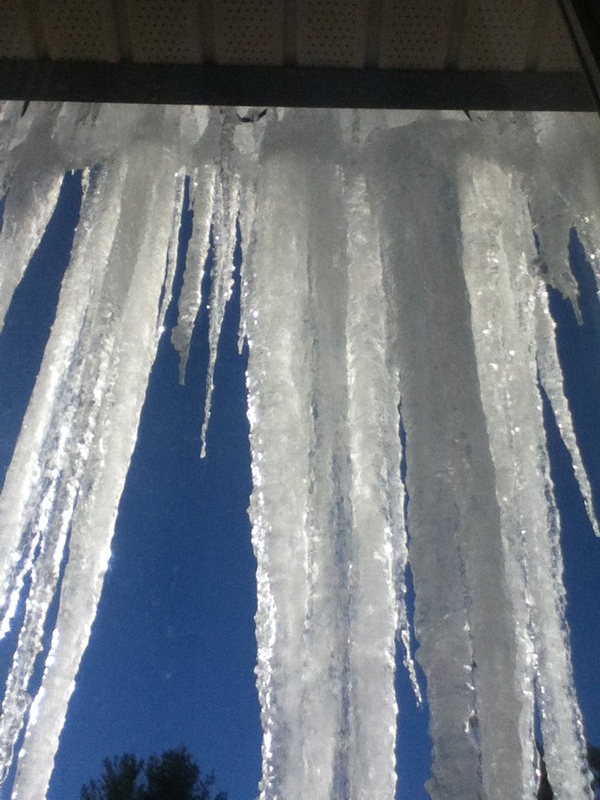 These are icicles, the only thing growing outdoors in Massachusetts right now. I know the thaw is coming but I am getting impatient. I want to grow things! I started investigating how to stretch the growing season here in USDA Plant Hardiness Zone 5, and there are a number of options. If you are not familiar with what Plant Hardiness zones are, check out this link. The obvious solution is to start growing things indoors. There are plenty of products you can buy that make this easy to do. Try typing “indoor garden kit” into your favorite search engine and see what pops up. Trust me, many options pop up in a wide range of price points. Or, you can simply line up some pots on a window sill, add soil and seeds, and see what comes up. There are even some really cool DIY ideas out there to satisfy your inner maker and inner farmer at the same time. Here are instructions for turning an old drawer into an indoor garden plot. Here are some indoor lettuce growing instructions using zip-top bags and written for children. What a cool classroom or birthday party activity! Did you know there are some vegetables you can just keep regrowing indoors? There are actually a lot of articles like this out there. I recommend again that you utilize your favorite search engine and surf around. You can also extend your outdoor growing season, although once there is snow involved the outdoors is often not an option. This can be done with a greenhouse or a cold frame. These two structures have the same purpose- make a small area warm enough to grow things outside when the outside is too cold to grow things. There are many variations on these structures, but typically a green house is tall enough to stand up in while a cold frame is low to the ground. Either can be used to grow plants in pots or built over a garden bed to warm the soil and give seeds an early start. Again, there are myriad greenhouse and cold frame kits available. There are even companies that will build them for you. But you know me. I think it is more fun to build one yourself. Here is a cool cold frame project from This Old House. It utilizes the traditional Old New England cold frame base- an Old Window. Here is a glass-free cold frame that uses a recycled skylight. I bet one of those plastic covers for basement window wells would work too, though. Green houses, because they are typically bigger, require more planning and higher skill level. Here are some practical tips for green house planning from UWV’s Extension Service. Once again I suggest using your favorite search engine for greenhouse plans- there are some easy, reasonably priced, semi-perminent (read: no building permits required in most places) ideas out there. So many choices! I don’t know where to start, but I’m feeling much less hopeless about my garden situation. Where should you start? Think about your budget, building skills, available materials and available space. With a little research everyone can find a way to get growing. You might find yourself hooked on food production after one bite of home grown goodness. Give it a try.